When studying the acoustic guitar, many players will find themselves learning the blues, blues form or blues fingerpicking patterns at some point in their development. Because the blues is such a staple of the modern guitarist’s repertoire, and it has been used as the basis for countless fingerstyle and acoustic guitar songs, having an understanding of the blues form, and a few acoustic guitar patterns under your fingers, can go a long when in your development as an acoustic guitarist. For this reason, in this lesson we’ll be exploring an easy acoustic blues pattern that will help increase your technique, provide you with a fun rhythm pattern to use when songwriting or jamming with other musicians, as well as develop your ability to play bass notes and melody lines all at the same time. A note on the melody lines: If you are just starting out with acoustic guitar, you might want to pluck each note in the melody line. Then, after you have worked that out, or if you are an intermediate player, you can add the slides and hammer-ons in to take these examples to the next level in your practice. As well, this lesson is geared towards students that are not total beginners to the guitar itself, but those that are ready to begin exploring the Acoustic Blues genre. So, grab your guitar and let’s dive into this fun, and easy acoustic blues pattern for guitar. To begin, let’s look at the bass line for the pattern on it’s own. When working on any fingerpicking pattern, especially one that mixes bass notes and melody lines, it is always a good idea to divide the parts up when first working out the pattern on the guitar. Though it is only two notes per chord, and relatively easy to get down, make sure you use a metronome when practicing this pattern as keeping a steady pulse in the bass is key to working out this pattern as a whole, both on it’s own and when applied to a full, 12-bar blues form. Click to hear audio for this easy acoustic blues pattern example. After working out the bass line on it’s own, you can move on to learning how to play the upper melody line on it’s own, before combining them to form the entire pattern in the next example in this lesson. Start by working one bar at a time, and then combining multiple bars to form the entire four-bar phrase. Doing so will allow you to really nail the time and feel of each bar on it’s own, before bringing things together to form the phrase as a whole. With the bass and melody lines worked out separately on your fretboard, you are now ready to combine these two ideas to form the final easy acoustic blues pattern on your guitar. If you find it tricky to combine both parts over the entire four-bar phrase at first, then try just the first bar on it’s own, and then the second bar on it’s own as well. With both of those bars worked out separately, you can begin to combine bars one and two together, followed by one, two and three, and finally all four bars together. Take it slow and work with a metronome during this pattern, as playing it smoothly in time is just as important as playing the correct notes when it comes to applying this pattern successfully to a blues chord progression, as you can see in the next example in this lesson. To finish up with this easy acoustic blues pattern, here is a full chorus of a Blues in E that uses the pattern for each bar in the chord progression, over the E7, A7 and B7 chords respectively. Start slowly with this pattern, as it can be tricky to put everything together into one long idea such as this study. If you are having trouble getting the entire form to sound smooth, then feel free to break it down into three, four-bar sections as that will allow you to work on smaller chunks of the music at one time, before bringing them all together to form the chorus as a whole later on when things are more comfortable on the fretboard. Do you have any questions regarding this easy acoustic blues pattern? Share your thoughts in the comments section below. 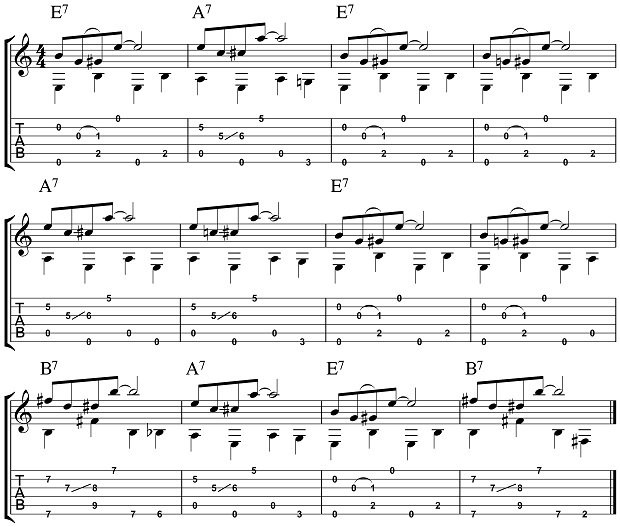 This entry was posted in Acoustic Guitar Lessons and tagged Acoustic Blues Lessons by Alan. Bookmark the permalink. Hi Matt, nice blues piece but it’s definitely not ‘easy’, not for my many beginners of all ages it isn’t! One has to be very careful with the use of the word ‘easy’. I love all this new stuff though, thank you for this site. Thanks Ruth, glad you liked the lesson. This definitely isn’t for absolute beginners. But, for players that are ready to explore the fingerpicking blues genre, this is a basic pattern as far as the difficulty level, as compared to other more intermediate or advanced patterns. That’s what the title suggests, not necessarily for the beginner player in general, but for the player just starting with this style of music. Thanks for reply Matt, yes ‘easy’ refers to the style of playing here. It’s just that if students see it without you or I or another teacher able to explain that it could put them off. Anyway, I seem to be on your list of people liking this site twice – don’t know how that happened, sorry! Hi Ruth, good point. I’ve added a sentence to the intro of the article to avoid any confusion. Glad you are liking the new site, enjoy the articles! would what would be the appropriate fretting finger position when playing the A7 and B7 chords? Hi Doug, try barring the 5th and 7th frets with your index finger for those chords, that should be the easiest way to play A7 and B7 in this context.